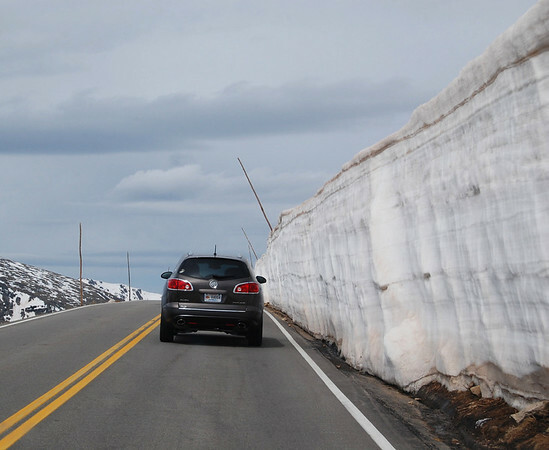 It was our last day in the Rocky Mountain National Park area and the plan was to drive the famous Trail Ridge Road which just opened this past weekend. 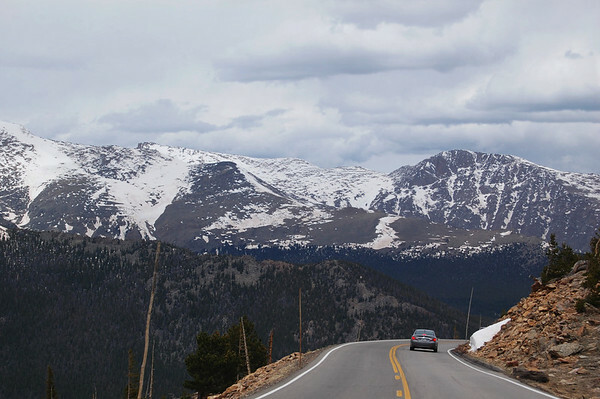 Trail Ridge Road is the highest continuous paved road in the U.S. and crosses the Rockies connecting Estes Park on the east side with the town of Grand Lake on the west side. 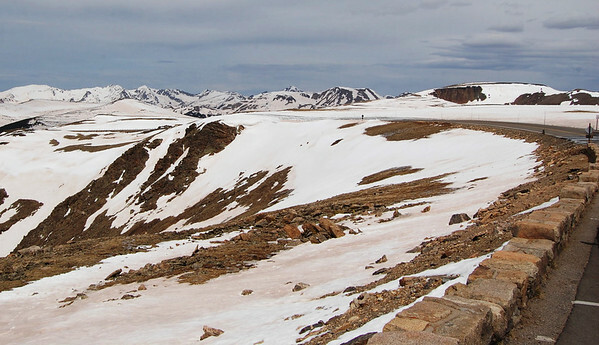 It's 48 miles long with eleven miles through the tundra above the tree line. 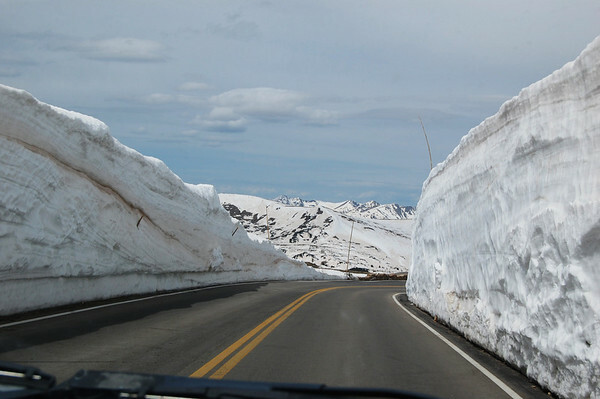 This time of year, they still close the road at night due to snow-melt that re-freezes and snow that blows across the road. So, going too early might mean a long wait. 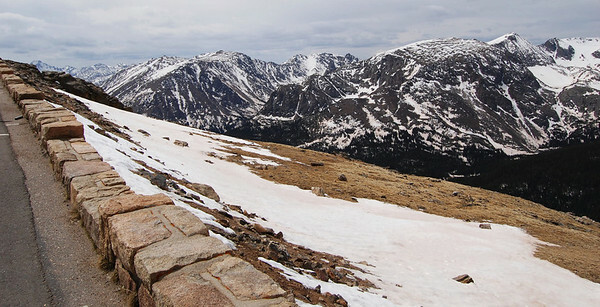 We got started about 10:00 and took our $2 Trail Ridge booklet which provides descriptions of 12 designated stops. This is the intersection of the park roads coming through the Fall River Entrance and the Beaver Meadows Entrance. 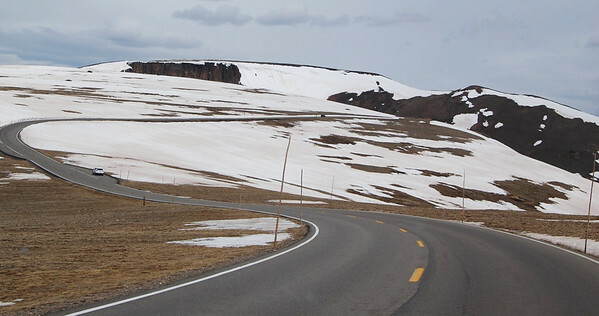 There is a short spur road to this stop which was home to a former downhill ski area. 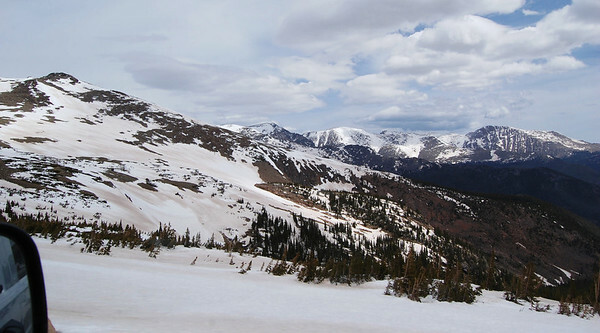 as well as snow-covered peaks on both sides. 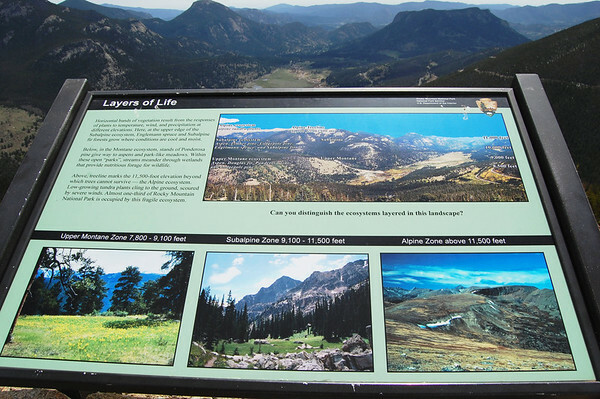 Between Many Parks Curve and the next stop at Rainbow Curve is a sign noting the two-mile high point (10,560 feet). 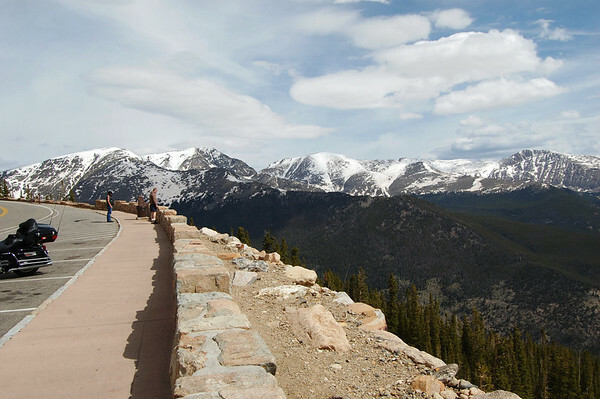 When we arrived, the Trail Ridge Road was open to this point. 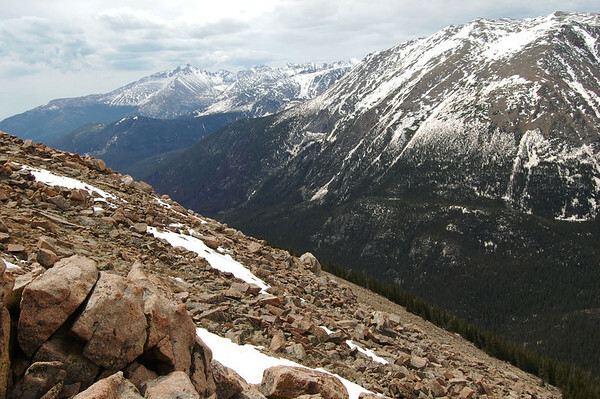 It has a view of Horseshoe Park including Sheep Lakes, Fall River, and the Alluvial Fan (a fan-shaped section of gravel, sand and boulder debris deposited when the earthen dam at Lawn Lake gave way in 1982). 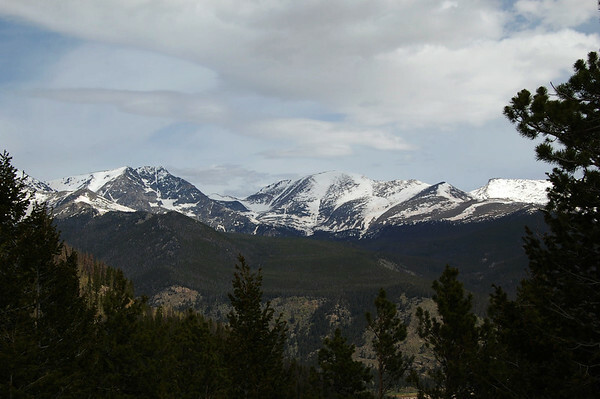 And of course, there was another view of mountains around the curve. Also at Rainbow Curve was this sign describing the various mountain eco-systems and their elevations: Upper Montaine - 7,800 to 9,100 feet; Subalpine - 9,100 to 11,500 feet; Alpine - over 11,50 feet. Here are a few photos from the drive to the next stop. There was a dark blue lake down in the canyon (bottom at the foot of the mountains). 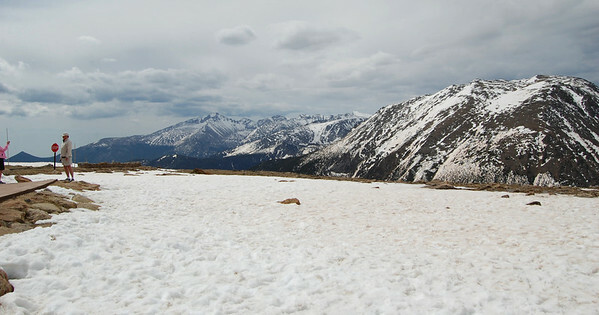 Along the path to the overlook, the snow had melted revealing the spongy, green tundra. 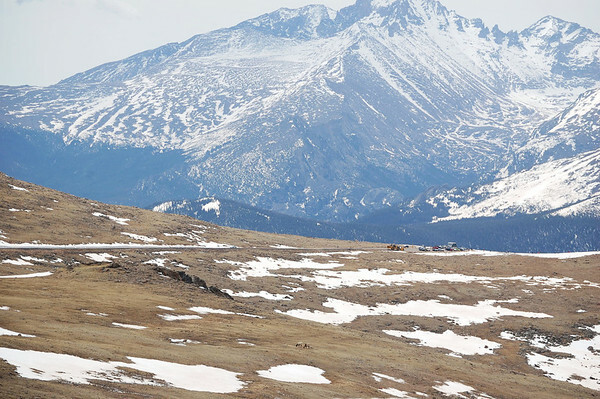 On the way to the next stop, Linda spotted some alpine Elk, but it was a little while before the next turnout where we could stop, so they are tiny in the bottom center of the next photo. and a couple of photos from the stop. 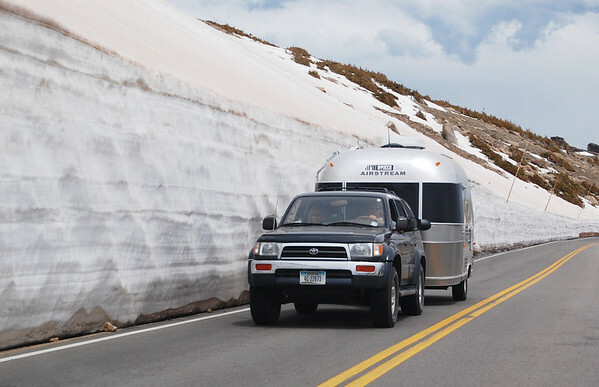 The snow on the sides of the road deepened as we approached the next stop. We didn't actually stop at Lava Cliffs, the highest of the designated tour stops. I think perhaps we were too stunned from the truck-fifth-wheel-boat-&-trailer combination we passed. 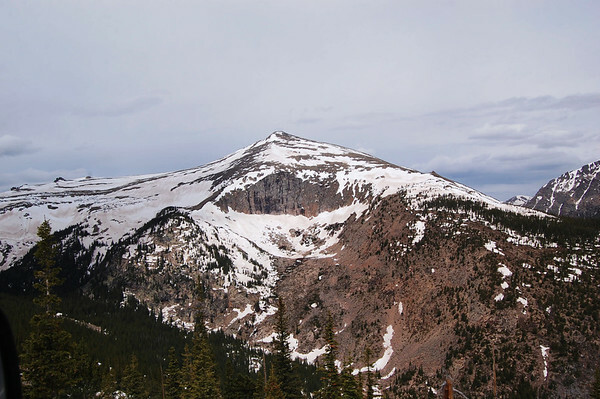 Past the Lava Cliffs, we came to the highest point on Trail Ridge at 12,183 feet before making a quick stop at the Gore Range Overlook which had one of the best views despite not being one of the designated tour stops. We couldn't stop here because it was closed. They were still literally digging out the building. We skipped this stop which was only a half-mile from the Visitor Center. Again, we didn't stop here. 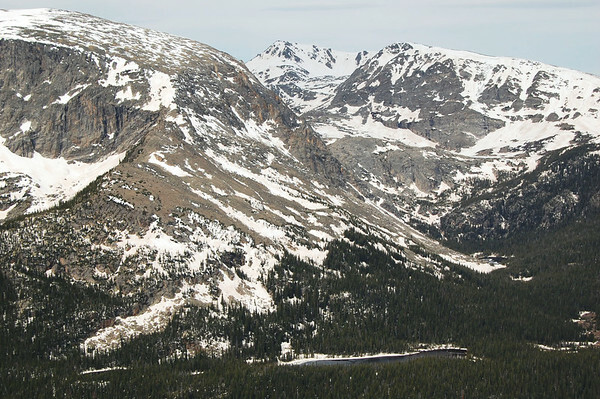 The Milner Pass stop has Poudre Lake (which was still completely frozen) and also marks the Continental Divide. Rain and melting snow on one side flows east and a few feet the other way, the water runs west. We by-passed this stop as well, but we certainly got a good look as we rounded the corner. Just past Farview Curve, the road descended quickly through a very curvy set of switchbacks (including five 15 mph hairpin curves). 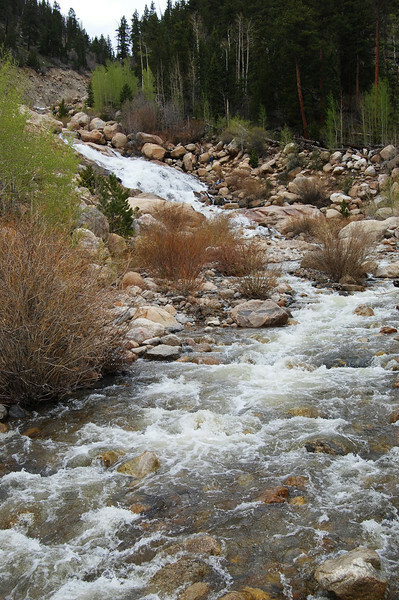 At the bottom, the beginning of the Colorado River flows through the valley and past the Timber Creek Campground. 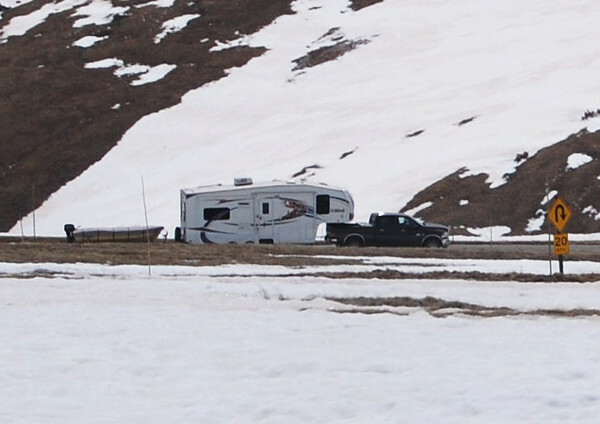 The campground has a 30-foot length limit, although there were three or four sites that could fit larger rigs. 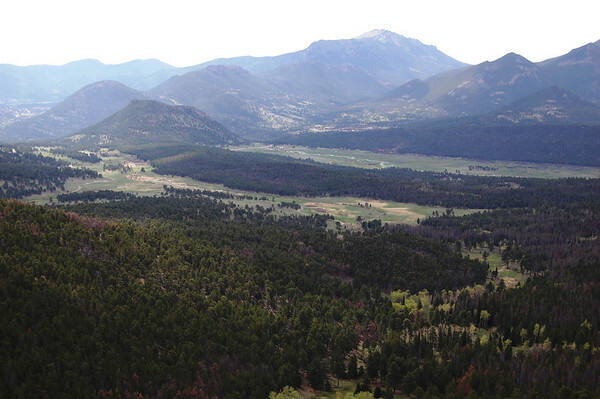 All the trees have been removed due to pine beetles and the fear that the trees that hadn't been killed would blow over on campers during high winds. We skipped this final stop on the self-guided road tour. 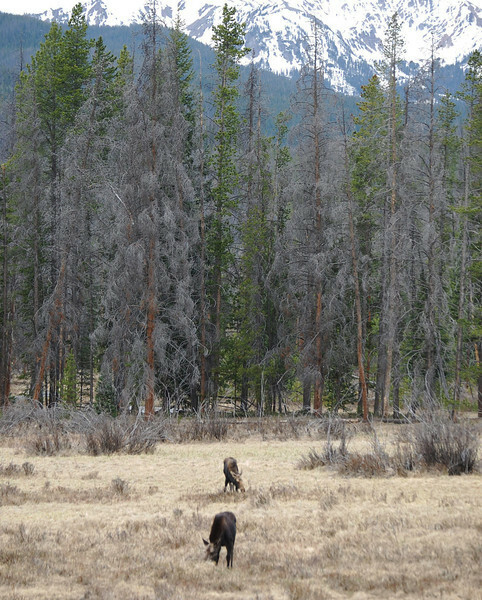 We continued on through the park where we saw herds of Elk. We then exited the park and drove through the town of Grand Lake. From there, we continued south to the town of Granby and looked at the Stillwater Campground. It has hook-ups and sits on a lake that is suffering from very low water. Soon we turned around and started the return trip. Just a little ways back in the National Park, I spotted a large black dot off to our left. 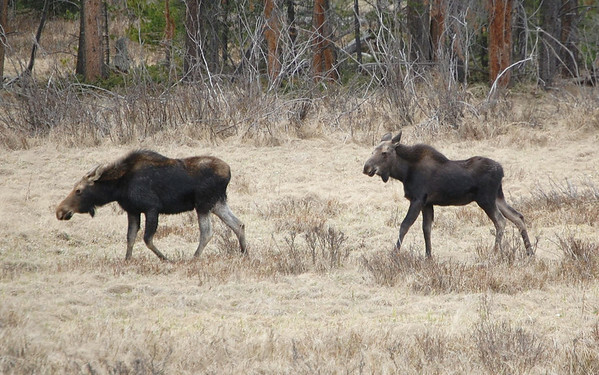 As we got closer, we realized there were three Moose feeding in the field. We always love a Moose sighting. This one was a good distance from the other two and would drop down on its knees to feed. These two stuck together and kept us entertained for several minutes. 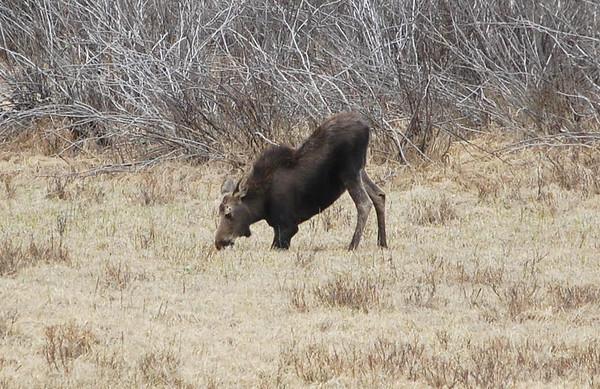 We hoped to see Moose, and we were quite excited to have the opportunity. After climbing back up into the mountains, Linda suggested I take a video of the drive. 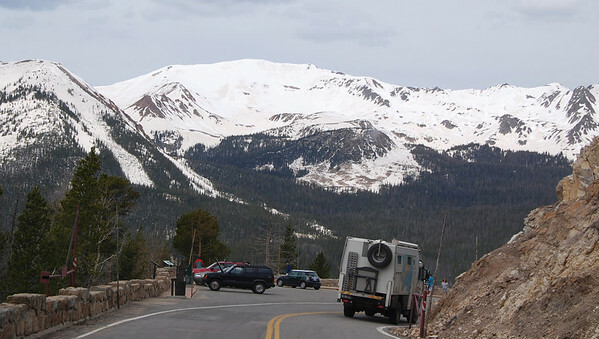 So, just past the Visitor Center, I took this five-minute video of the highest points on the road. Near where we saw the alpine Elk earlier, there were a few more, so I did a drive-by video. One last shot on our return descent to the eastern side of the park. 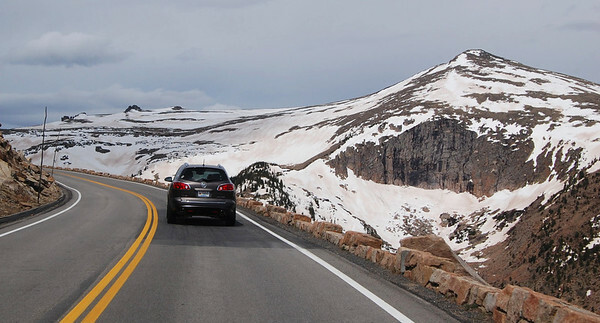 One thing that was amazing was how good of shape the road was in - no potholes, dips, frost heaves, or anything. It made us wonder why other roads can't be as good. Rather than return the way we came through Beaver Meadows, we turned left and headed down into Horseshoe Park. 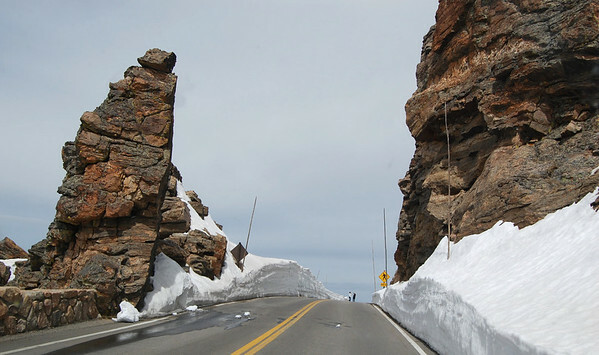 The Fall River Road was still closed, but it was open farther than the other day when we checked it out. We parked at the West Alluvial Fan parking lot with the intention of checking out the waterfall there. But first, we noticed a small crowd off to the left and looking up with binoculars. 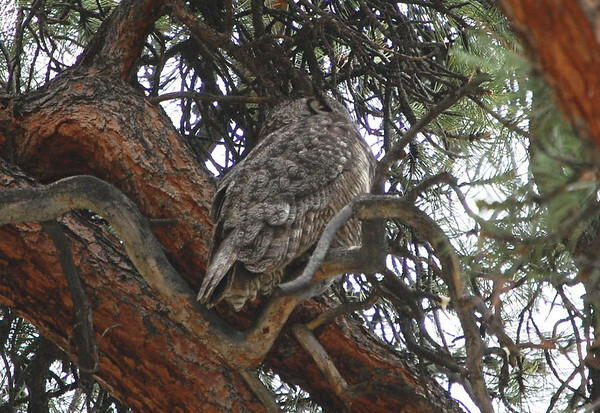 Up in a Ponderosa Pine a Great Horned Owl blended in. 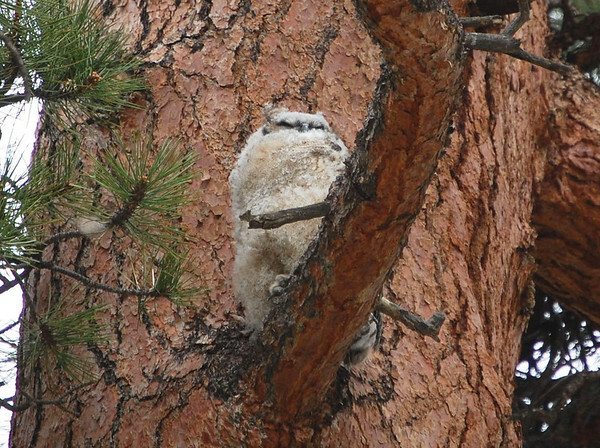 And just to her left was a big, puffy owlet. We couldn't get a great look, but it was good enough. 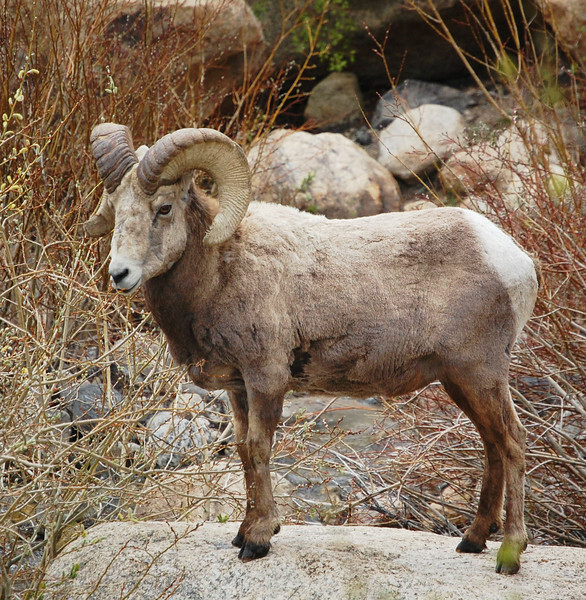 While looking at the owls, we heard some rumblings about Bighorn Sheep in the area. 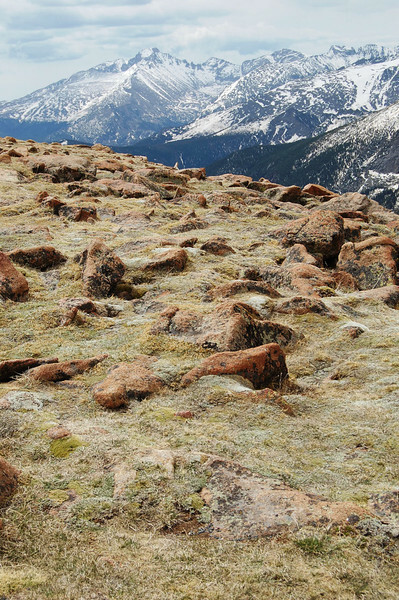 We looked up onto the rocky hills to see if we could spot them, but there was no movement. We walked up onto a bridge over the Falls River for a view of the waterfall. 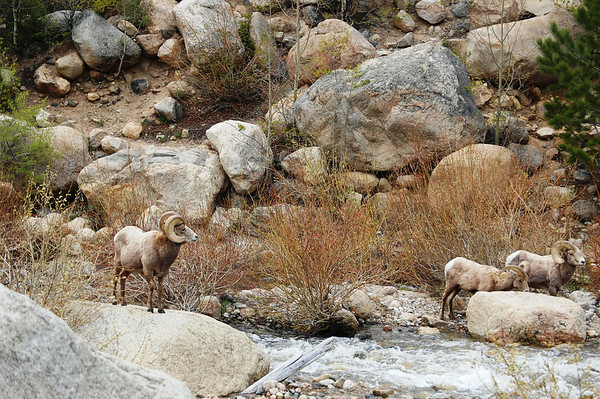 We walked up along the river and there, standing right in front of us, were three Bighorn rams. 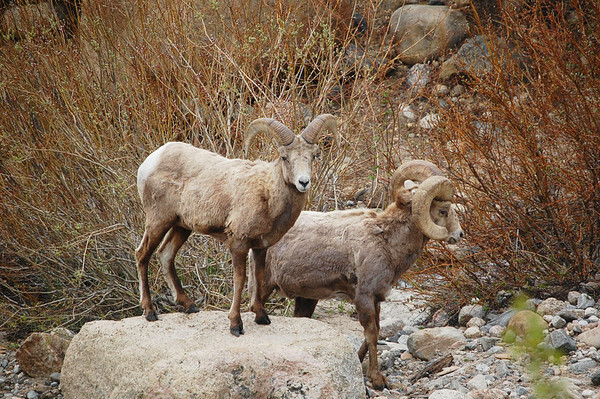 We've seen ewes and youngsters, but these are the first mature Rocky Mountain Bighorn rams with full horn curls we've seen in the wild. It was thrilling. Rangers did crowd control and made sure that we all gave the rams enough space to cross the river. When there was enough room and they were comfortable, the boys bounded away. 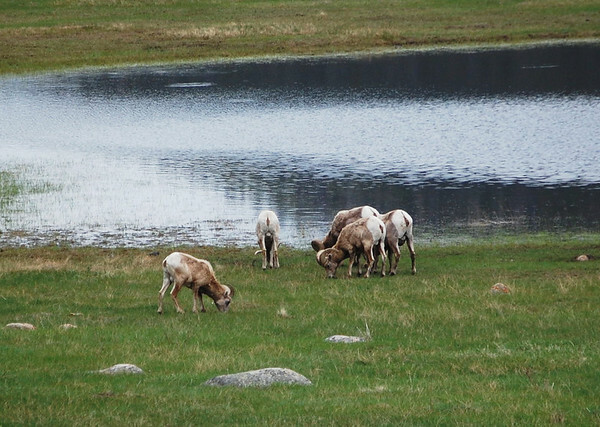 The rangers presumed they were headed to Sheep Lakes. 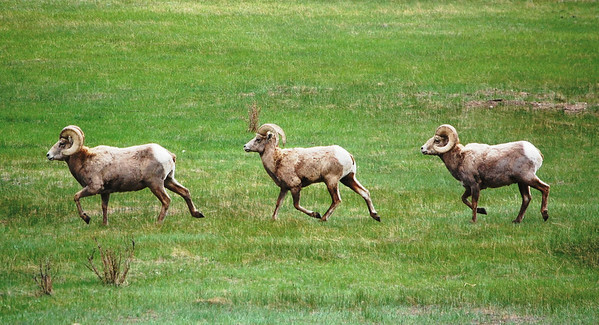 Although, I already had lots of great pics, we drove to the Sheep Lakes parking lot to await the arrival of the rams. 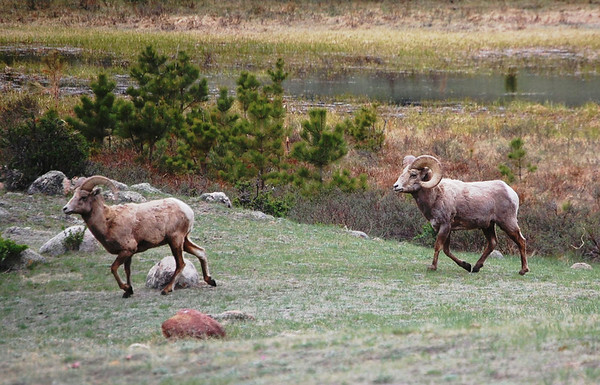 After chatting with professional photographers that were hanging around, the rams eventually appeared. and join up with a couple of younger sheep. What a day we had. 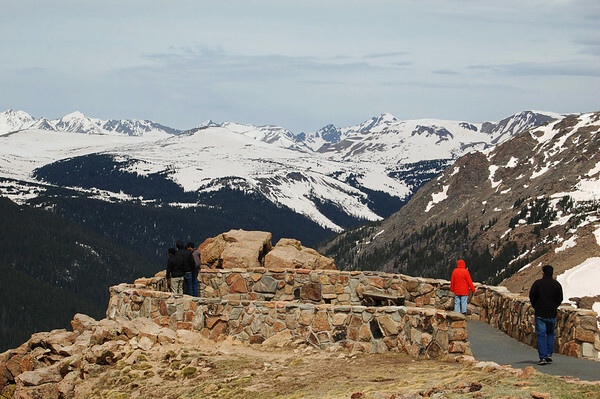 The Trail Ridge Road offered the rare opportunity to drive through the tops of the mountains. 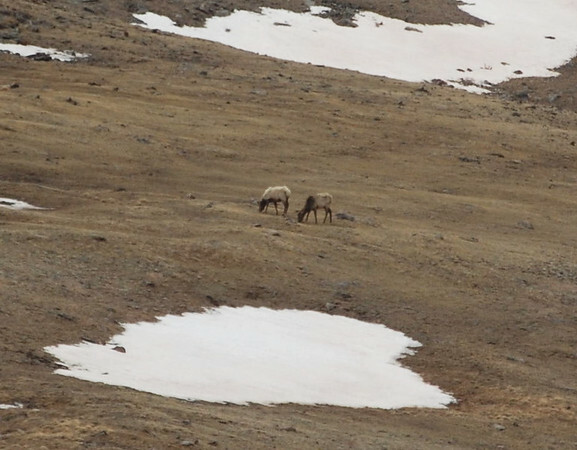 And the Moose and Bighorn Sheep sightings were a terrific bonus. In addition, this week we saw lots and lots of Elk, small herds of Mule Deer, a Turkey or two, a Coyote that I forgot to mention yesterday, and we think we saw a Gray Fox scurrying across the road this afternoon. Before exiting the park at the Fall River Entrance, we drove through the Aspenglen Campground. 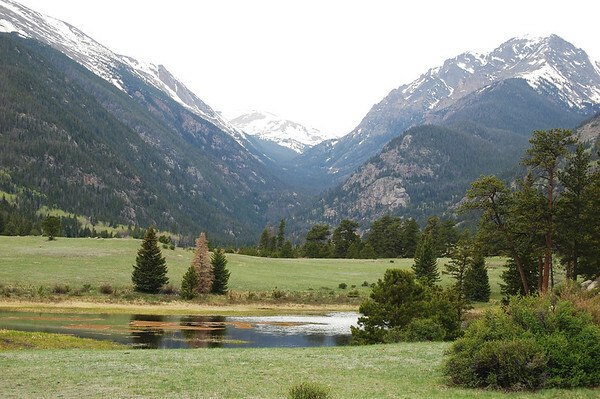 We liked it much better than the Moraine Park Campground, and there were three or four sites that would work for us. The approach to the park on the Fall River side was really pretty. 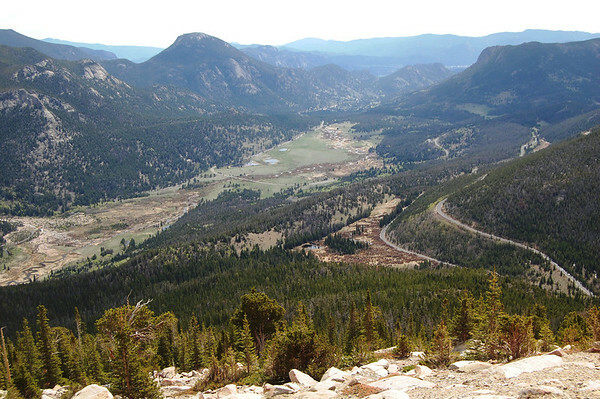 The road led us into Estes Park from a different direction. 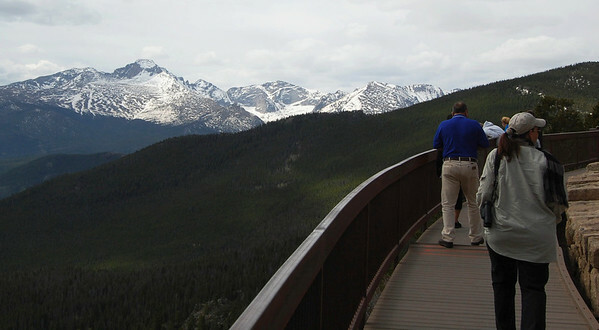 Well, we've had a great time in Rocky Mountain National Park, and we'll be back. 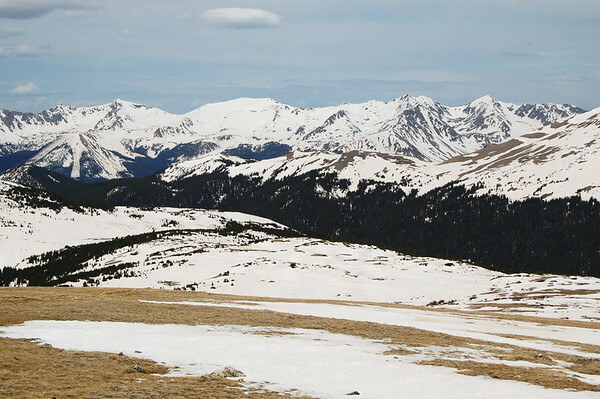 There is a lot more to see and do in the park and in the surrounding National Forest, but perhaps we'll wait until just a little later in the year next time.